Liquid crystal. 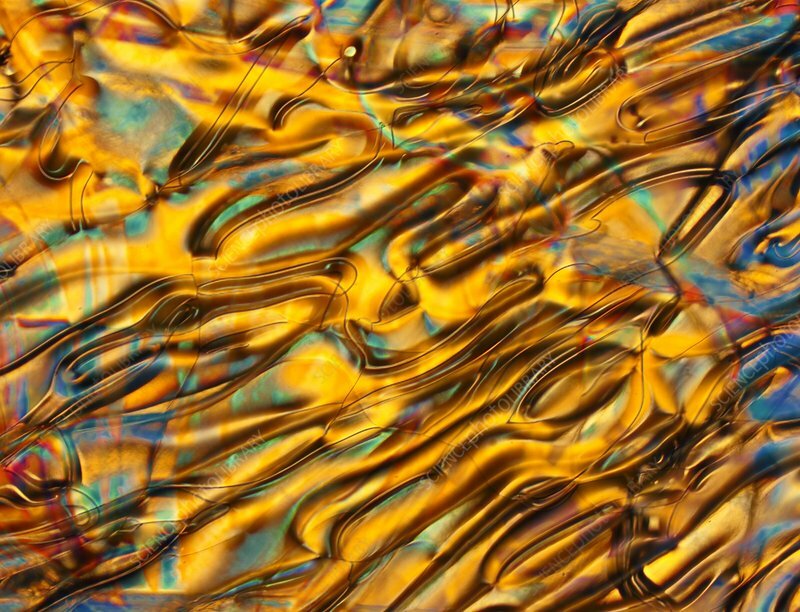 Polarised light micrograph of liquid crystal. Although liquid crystal (LC) flows like a fluid, its molecular arrangement exhibits some order. Liquid crystals are used in liquid crystal displays (LCD), for example in calculators and digital watches. An LCD has a film of LC sandwiched between crossed polarisers and set on top of a mirror. In the off state light is able to traverse both polarisers, penetrate the LC and reflect back off the mirror. In the 'on' state an electric field applied across the LC alters its molecular alignment and hence its polarising properties; light cannot traverse both polarisers to reach the mirror and the display appears dark. Object size 3.0 mm across.